Daria Von Doom by RLobinske. Daria Von Doom is a series of stories by Richard Lobinske that postulates that Daria's actual father (by in vitro fertilization) is Victor Von Doom. During the summer between her junior and senior years of high school, Daria accepts an invitation to study in Latveria, where she learns her true heritage. 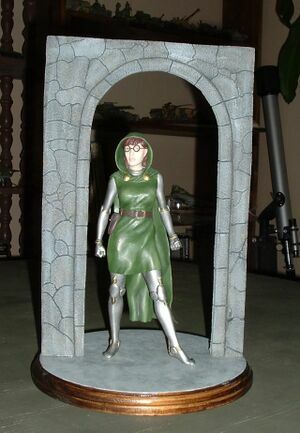 She becomes Doctor Doom's heir and takes the name Daria Von Doom. This stories heavily crosses over with the Marvel Universe and includes appearances by the Fantastic Four, Daria's eventual romantic interest Franklin Richards, Valeria Richards, Spider-Man, Squirrel Girl, Doctor Doom, Mephisto, and Kang the Conquerer. This takes place in an alternate universe spun off from Is It Fall Yet? Missing Jane and hurt by what appears to be Tom Sloane's attempts to hide her from his family, Daria accepts an unusual invitation to attend the Royal Latverian Academy to get out of volunteering at Mr. O'Neill's Okay to Cry Corral summer camp. Ten years after "Is It Doom Yet? ", the people of Latveria vote down Queen Daria's proposed constitution, leaving her still the undisputed monarch of the country. Popular tradition, however, expects Daria to marry soon. Tending to her first child, Princess Jane Valeria, Queen Daria is surprised by the arrival of her biological father, Doctor Doom, returning in defeat from his attempt to rule Hell. This page was last edited on 15 May 2018, at 20:13.